We’d love your help. Let us know what’s wrong with this preview of Last Night at the Blue Alice by Mehitobel Wilson. The crumbling Blue Alice has been gathering ghosts for over a hundred years. Once a grand mansion, it was converted to a rooming house in the Mollie Chandler is on the verge of joining a shadowy Order whose magical operatives, the Glymjacks, manipulate events of the past. As the only candidate for the role of Psychopomp, she must pass one final test before the job is hers. If she fails, Mollie will not survive - if she’s lucky. The alternatives to death are far worse. To ask other readers questions about Last Night at the Blue Alice, please sign up. Awhile back, Necro Publications sent me a box of books for potential review. There were several good books in that box and one shining star by an author I'd never heard of. It took a while for me to get to it and, truth be told, I kind of forgot about it. Then I was reading Brian Keene's list of favorite reads for 2015 and was reminded of it. Mehitobel Wilson's LAST NIGHT AT THE BLUE ALICE was number three on that list, a high honor coming from Brian and, as I was to discover for myself, one tha Awhile back, Necro Publications sent me a box of books for potential review. There were several good books in that box and one shining star by an author I'd never heard of. It took a while for me to get to it and, truth be told, I kind of forgot about it. Then I was reading Brian Keene's list of favorite reads for 2015 and was reminded of it. Mehitobel Wilson's LAST NIGHT AT THE BLUE ALICE was number three on that list, a high honor coming from Brian and, as I was to discover for myself, one that was well deserved. LAST NIGHT AT THE BLUE ALICE is a ghost story of sorts, but also so much more than that. It’s a genre busting literary hybrid of quiet horror and dark fantasy like nothing you’ve ever read, penned by an author at the top of the new generation of authors constructing the shape of horror. Mollie, the protagonist, is a psychopomp who has been given a series of assignments she must complete in one night, each designed to prevent the potential haunting of The Blue Alice. I’m not going to say much more about the plot than that. Read the synopsis at the end of this review for a full description of the book. Suffice it to say that each scenario Molly faces would work pretty damn well as a standalone story but works even better as an integral piece in a larger puzzle, all coming together to create an entertaining, engaging and addictive novella. Once I started reading BLUE ALICE the evening was over for me. There was no looking back and no putting the book down until I reached the somewhat hilarious and ultimately satisfying conclusion. LAST NIGHT AT THE BLUE ALICE is my first experience of Mehitobel Wilson’s work and I have to say I am truly grateful to Necro/Bedlam for sending it to me. Bel Wilson has created a beautiful and haunting story that will stay with me and that I will return to again, maybe more than once. My reading habits normally tend toward much darker, more brutal fiction than BLUE ALICE but I’d recommend it to any avid fan of horror or, for that matter, any fan of damn good literature in general. If you haven’t read Mehitobel Wilson, it’s time to fix that. Check out LAST NIGHT AT THE BLUE ALICE, then go and find everything else you can by this outstanding author. Her short stories are of a darker and more horrific variety but are easily as well written and engaging as this outstanding novella. I wasn't ready for this book so it took me a minute to wrap my head around what was happening. It's a series of ghostly interludes involving a psychopomp and then takes it a step further...and that's all I'm going to spoil. By the second interlude I was pretty hooked. I was thoroughly engaged with the characters (both dead and alive) though I might have liked to know a little more about Mollie and what she did outside of "psychopomping" but in hindsight probably best left for another time. I'm p I wasn't ready for this book so it took me a minute to wrap my head around what was happening. It's a series of ghostly interludes involving a psychopomp and then takes it a step further...and that's all I'm going to spoil. By the second interlude I was pretty hooked. I was thoroughly engaged with the characters (both dead and alive) though I might have liked to know a little more about Mollie and what she did outside of "psychopomping" but in hindsight probably best left for another time. I'm pretty satisfied in giving this one a 4.5 and a little round up to a 5 star. Mollie Chandler has almost completed her training to become a psychopomp – an entity that helps souls to move on to the afterlife. She has one final test that she must complete: Spend one night at the Blue Alice, the most haunted house in the Commonwealth, to come to understand the lives of past residents in order to prevent them from becoming ghosts and haunting the home in the future. If Mollie should fail her test, if could mean death for her – or far, far worse. The Last Night at the Blue Ali Mollie Chandler has almost completed her training to become a psychopomp – an entity that helps souls to move on to the afterlife. She has one final test that she must complete: Spend one night at the Blue Alice, the most haunted house in the Commonwealth, to come to understand the lives of past residents in order to prevent them from becoming ghosts and haunting the home in the future. If Mollie should fail her test, if could mean death for her – or far, far worse. The Last Night at the Blue Alice blends time travel, Greek mythology, and horror into a wonderful little book. Wilson has created an oubliette into which all of the time travel scenes morph seamlessly into each other. She pays careful attention to the decades – my personal favorite was the goth scene in the mid-90’s. Man, oh man, did that take me back! The soundtrack for this chapter hit home and made me remember exactly how much Switchblade Symphony that I listened to back in the day. I digress…. I felt like this didn't really deliver fully on the premise. I enjoyed it but I wasn't blown away by it. Full review coming soon. This is not a genre I usually read, so I was a little hesitant going in, but was very happy I took a chance! The main character, Mollie, is a trainee psychopomp, a person who guides souls into the afterlife. "Last Night at the Blue Alice" tells the story of Mollie's interactions with several people who are living through the last day of their lives, all the same boarding house, the eponymous Blue Alice. Some of these people are appealing and relatable, and some are not pleasant at all. I apprecia This is not a genre I usually read, so I was a little hesitant going in, but was very happy I took a chance! The main character, Mollie, is a trainee psychopomp, a person who guides souls into the afterlife. "Last Night at the Blue Alice" tells the story of Mollie's interactions with several people who are living through the last day of their lives, all the same boarding house, the eponymous Blue Alice. Some of these people are appealing and relatable, and some are not pleasant at all. I appreciated the author's willingness to treat each of them as an individual. At one point I laughed out loud at one character, only to get teary-eyed about them a few pages later. There are a few things that could have gone wrong here, but the author handles them well. Since the whole book is set in one house, and each chapter is set in the person's room, it would have been easy to have this turn claustrophobic, but it doesn't. Even though we see the character only in his or her room, we still get a feeling of what their lives are like outside this confined space. In addition, each person is from a different time, so it must have been a challenge to nail that time down while staying in that one room, but again, deft handling by the author. I especially enjoyed the copper molds hanging on the wall in the 70s kitchen, and the goth girl from the 90s. The frisson of recognition was a lot of fun in those chapters. As I said before, each of the people about to die is very different, and the way Mollie handles their cases has to be adjusted for this. One of her decisions was legitimately so scary to me that I thought I wouldn't be able to continue! I enjoyed Mollie's reasoning about how she decided on her actions each time. My only complaint was that at first, I had trouble discerning who was alive and who was dead, and I was a bit confused about what Mollie's role was. I think this might have been my unfamiliarity with the genre. Even though I struggled a bit at the beginning, I appreciated the fact that there was no infodump about haints, the Glymjacks, etc. I like being able to figure it out myself, but it never felt like info was being withheld to create artificial suspense. Also props to the author for excellent grammar and no annoying sentence fragments. It's nice to read real sentences. I won a signed copy of this book through Goodread's Giveaways. I enjoyed this book very much. It was a fantastic sci-fi/ghost story. I enjoyed meeting all the residents of the Blue Alice and learning their stories. I felt that even though the book was a quick read (I finished in less than 24 hours) that the characters were fleshed out nicely. My only complaint about this story is that I felt it ended too soon. I hope that the author is considering turning this into a series because I would definit I won a signed copy of this book through Goodread's Giveaways. I won a copy of this novel in a Goodreads giveaway, and I love that I did!! I absolutely loved this novel, and I know my daughter will too!! Every chapter holds something different, but is beautifully written and flows together perfectly. All the characters are wonderful, interesting and believable. The plot is fun, unique, fast paced and draws you in from beginning to end!! A great book for young adults to adults!! Perfect read about an old house and its ghostly residents. Original and fun. I liked the ghosts, their unique chapters, with Mollie's presence and role in their existence giving each ghost suspense and added character. Fun to choose my favorite ghosts, and see how each one affects Mollie's progress toward her goal. 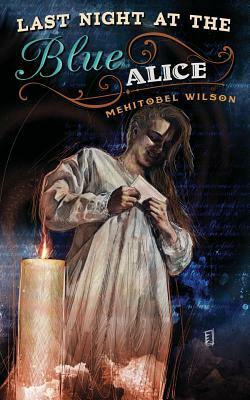 So many elements make this story 'just right' reading for those of us who like haunted old house stories, and Mehitobel Wilson delivers with an awesome take on the genre. I received this book as a First Read. The short chapters make for a fast read. The concept is interesting. I was hoping the book would be more spooky or pure horror but it fell more into comic horror. A nice middle grade or YA intro to the horror genre. Not what I expected - and not quite like anything else I've read. I really enjoyed this book. Weird things going on at the Blue Alice. Ghosts, Psychopomps, Glymjacks?! Beautifully written, some descriptions are really delightful, especially of the Blue Alice itself.